Positioned at the heart of the capital, Trafalgar Square is a natural home for protests, marches and celebrations. It's also where a number of free outdoor events, hosted by the London Mayor, are held throughout the year. Festivals marking London's multicultural mix start with Chinese New Year celebrations in January and end with carols around a huge Norwegian pine tree in December. Celebrations for St Patrick's Day, St George's Day, Vasisakhi and Diwali take place in between with music, dance and street theatre making these colourful spectacles. When the occasion warrants it a big screen is erected here broadcasting major events live including the Olympics, Wimbledon Charity matches, the First Night of the Proms and VE Day celebrations. Even if you don't manage to time your visit to coincide with one of the free festivals, Trafalgar Square is one of London's top free attractions. Overlooked by Lord Nelson, with the National Gallery on one side and the fountains in the middle, people flock to this pedestrianised space to sit on the great bronze lions and take in the buzz of the city. It's always interesting to see what's on The Fourth Plinth, Britain's most prominent site for contemporary sculpture. Each work is allocated 12 to 18 months on display and the commissions are always exciting, sometimes controversial and a great showcase for modern art. One of London's two largest arts centres and bastions of culture, the Barbican Centre does its best to allow everyone to enjoy the arts, even if you can't afford the usual ticket price. Alongside paid for events there free concerts, talks, exhibitions, events, music and festivals which regularly take place throughout the year. You'll also come across free exhibitions, live music, or talks. If you're lucky you'll hit off a major arts celebrity confiding to a small crowd in some odd corner of the building. Don't be put off by the mass of concrete and confusing corridors which can be tricky to find your way around, this is one of the most impressive and dynamic cultural sites in London and its free events are certainly worth seeking out. At the Southbank on Fridays and Saturdays, the Royal Festival Hall hosts free lunchtime concerts in its central bar; there are free book readings and recitals at the Poetry Library on the fifth floor of the Royal Festival Hall; and in the summer you can see certain performances for free as part of the E4 Udderbelly festival. Go to the Southbank Centre's ticketing website to find listings of all the free events. A stroll along the Southbank is free too: browse among the book stalls, take in the terraces and see the skateboarders - a happy architectural accident has made this complex the best spot for skateboarding and BMXing in the capital, meaning it is loved by London's counter-culture as much as by its highbrow elite. While you may have to pay for the privilege of seeing well known comedians there are hundreds of aspiring funny men (and women) who are quite happy to deliver their one-liners for free. A good place to start is the renowned Comedy Cafe on a Wednesday night when 'New Act Night' sees eight acts (as opposed to the usual four) on stage, so even if someone is really struggling they're not on long enough for total humiliation. On a good night you can see some utterly hilarious performers without paying a penny. In the past the Comedy Cafe has been a much loved hang-out for comedic geniuses such as Eddie Izzard, Mark Lamarr and Jo Brand. Who knows, you may spot the next Russell Brand before they become famous. Another good source of free comedy is the pub - or more specifically, the room above a pub. London has more than its fair share of these. The Queen's Head, close to Piccadilly Circus, is just one example of a pub mixing pints and jokes at their absolutely free comedy night. On Mondays at the Carnivale just off Whitchapel Road are 'Comedy Bin' open mic nights where you get to see new comic talent for the mere price of a pint. Cheers! Some of London's most beautiful churches and cathedrals provide stunning acoustics for organ recitals and classical concerts, some of which are free. Southwark Cathedral, London's oldest Gothic church (dating back to c1220) hosts free lunchtime concerts with organ recitals taking place on Monday lunchtimes and Tuesdays afternoons and there are regular choral services allowing the cathedral's fine Lewis Organ to display its magnificence. The cathedral is also open during the day for visitors to explore and includes a chapel commemorating John Harvard, benefactor of Harvard University. Similarly, St James's Church Piccadilly is well known for its lively programme of events and while some of the evening concerts do require an admission fee the 50-minute lunchtime recitals are often free (with a suggested donation). In the heart of London, overlooking Trafalgar Square, the roof of St Martin-in-the-Fields is often raised by the sound of religious and classical music ringing out with its choral scholars among those performing gratis. Candelit concerts are held from Thursday to Saturday and there are free lunchtime recitals on Mondays, Tuesdays and Fridays. All profits go to support the work of the church, with its particular ministry to the homeless. 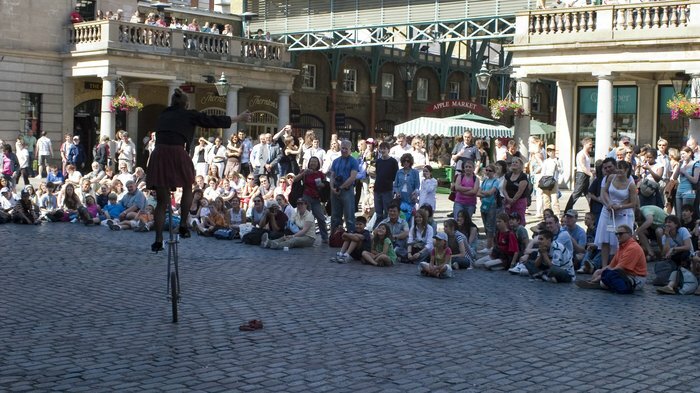 Where Covent Garden Market meets the Piazza place there is a large open-air cobbled area where free street theatre, music and performance art take place on a regular basis. Miming and juggling acts are staples, alongside spontaneous displays of magic, music and dance. There are also free big-screen relays of Royal Opera House concerts and ballets during the summer. If you are in the mood for spending some money, the 40ish market stalls sell a variety of quality goods: antiques, craft items, pictures and handmade clothing making this a great place to browse for gifts. If there's a big film premier in London, it will be in Leicester Square. With Trafalgar Square to the south, Piccadilly Circus to the west, China Town to the north and Covent Garden to the east, Leicester Square is right in the thick of the West End and it's seen more celebrities than The Ivy. Surrounded by the city's largest cinemas, the square is often bedecked with the latest blockbuster paraphernalia ready for the stars to stroll down the red carpet later that evening. Premieres happen on a regular basis and attract sizeable crowds, staking out their position in the square well before the red carpet is rolled out, hoping to get a good spot from where they can glimpse their beloved idols (and their outfits). The premieres typically begin at seven o'clock in the evening but it's best to turn up at least a couple of hours early so you can get that perfect celeb-stroking spot. Regular gig going can be a very costly hobby but some concerts can be enjoyed for nada, nothing, absolutely free. Sure, you may be taking a gamble on some unknown, unsigned band but what's to complain about? It won't set you back a bean. You'll need to research when and where these up and coming bands are playing but good venues to check include pubs and clubs like Ain't Nothing But Blues Bar, The Lock Tavern and the Notting Hill Arts Club who stage regular free gigs and open mic nights. Just beware of time restrictions like 'free entry before 10pm' or gigs taking place during the day. At Notting Hill Arts Club, for example, they've partnered with record label Rough Trade to showcase bands for free on Saturday afternoons. You can also catch bands performing at the Rough Trade London stores, Rough Trade East and Rough Trade West, several times a week. You'll need to secure a wristband to get in - they're handed out for free an hour before the gig on a first-come-first-serve basis. Or, if you genuinely like the band you're going to see, buy their album on the day and you'll get free entry to the live show. If jazz is your thing your really shouldn't miss Ray's Jazz Cafe at Foyles bookshop. Alongside the books and CDs for sale you can catch regular live jazz sessions for free when musicians have an album to launch in the specialist section of this charming Charing Cross Road bookshop. In the summer months London has several fun festivals where the music is free - Notting Hill being the most famous. The warmer weather brings with it another good source of free music: London's bandstands. Many of these pretty wrought iron pavilions have been restored so they're fit to serve their original purpose. Clapham Common, for example, home to London's oldest and largest bandstand, serves up a mix of musical styles including opera, jazz and folk, all for free, from June to September. Not strictly classed as "entertainment", this bastion of British free public speech and free assembly can prove one of the most absorbingly unique, theatrical activities the city has to offer. Located on the corner of Park Lane and Cumberland Gate, opposite Marble Arch tube, Speakers' Corner is the spiritual home of the British democratic tradition of soapbox oratory. Every Sunday since the right of free assembly was recognised in 1872 in the Royal Parks and Garden's Act, people from all walks of life have gathered to listen to speeches about anything and everything... and to heckle. From Socialism to Sunday trading, sausages to space invaders, the opinions aired here are varied and fascinating. While Karl Marx, Lenin, George Orwell, and William Morris have all used this spot to express their ideals and beliefs, your average speaker isn't quite as high profile. The coherence of the speakers also varies greatly, but as a whole it makes for great street theatre. Come and watch, come and heckle, or, if you have a burning desire to share your opinions with the world, come and spout - take something to stand on and start pontificating. Although Sunday morning is the best time to visit, speakers can also be found on the corner throughout the week. Talk is free at most of London's esteemed institutions. Free lectures frequently take place at well known venues like the Southbank Centre and the Barbican and at the city's prestigious art galleries and major museums. The Tate Modern, Tate Britain, Royal Academy of Arts, National Gallery and National Portrait Gallery all offer free talks often given by respected art historians, experts on their given topic. Similarly, London's museums provide stimulating food for thought for nothing - almost all of the daytime talks at the British Museum, for example, are free. At the Science Museum, the Dana Centre opens up the world of science (for adults only) while at the nearby Natural History Museum's Darwin Centre you can sign up for free talks on the natural world. It's not just the large institutions that dabble in free debate, smaller venues like the Rich Mix Centre and the Wellcome Collection are also worth checking for free talks, lively lectures, debates and discussions. Book signings are another good bet for getting gratis access to well known literary figures and talking heads. Bookshops including Foyles, Hatchards, Daunt's and Waterstone's are all well known for their author events, and if there is a charge you usually get a glass of wine thrown in so they're as good as free. Whoever said talk is cheap? Explore London by foot on one of these educational walking tours. A great way to discover London is through one of the many free walking tours that are available, enabling you to get up close and personal with the sights while also learning about the history and culture behind them. Golden Tours offer three free London walking tours, including a Covent Garden Walking Tour, exploring one of the city's most vibrant and popular areas; a Royal Walking Tour, enabling you to walk in the footsteps of Prince William and Catherine Duchess of Cambridge and see the Changing of the Guard at Buckingham Palace; and a Beatles London Walking Tour, which takes a stroll back in time and looks at the places where the band used to play and record. Further free tours include the two and a half hour Free Tour of London with Sandemans New Europe, taking in sights such as The Houses of Parliament, Westminster Abbey, Trafalgar Square and 10 Downing Street; a City and Southbank Walk by Free London Walking Tours, taking in the South Bank; and London's Ghostly Haunts Walk, which showcases London as the most haunted city in the world. The tours are free but still need to be booked in advance and gratuities are common and always welcome. From cheap budget hotels to luxury 5 star hotels see our deals for hotels, including Grange White Hall Hotel London from 57% off.